This accommodation cannot yet be booked on SleepOut.com. Find more accommodation options in United Kingdom. Situated in a lovely well managed terraced block is the unique 1 bedroom apartment with its own private garden. The apartment comes with a separate kitchen, dinning area and bathroom with the bedroom located at the rear of the apartment. 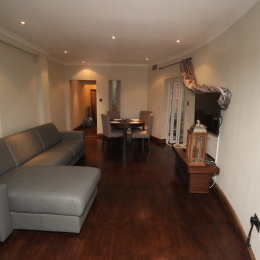 The apartment is spacious and clean with newly fitted appliances and furniture. The apartment has been designed for 4 persons and with a double sofa bed for additional guests. Guests will be allowed to use the entire property for there own use with 24hr access. Before you arrive I or a member of my team will meet you at the property to hand you the keys and walk you around the apartment. The neighbourhood can not be beaten in terms of amenities and transportation. Everything from restaurants, bars, stations, parks, sightseeing and adventure are right at your doorstep.